Filed to: Not Superleggera!Filed to: Not Superleggera! 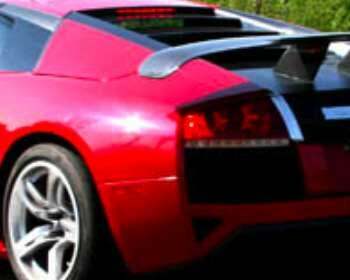 The UK's Car magazine refutes those who'd called the top-secret, lightweight Lamborghini Murciélago "superleggera" like its Gallardo counterpart. Car says its sources say Lambo is going with another apt descriptor from its past, "superveloce." Fans of the old Miura (like the late Shah of Iran) will recognize the translation of "super fast" as once adding sparkle to a limited-edition version, the rare Miura P400 SV, in the early 1970s. The Murciélago LP640 SV, which reports say will have a lower curb weight, shorter gear ratios, a higher power-to-weight ratio and a wing supplied by the flyboys at Boeing. All-wheel-drive stays, but the shorter ratios will pull top speed backward to 200 mph. We'll see it at the Frankfurt show in September.